A slowly rising and tilt down of the Austin, Texas city skyline on a late Fall overcast day. The Colorado River is in the foreground. A high angle reverse aerial establishing shot of the Texas, Austin skyline with the Colorado River in the foreground. Late Autumn day with foliage trees. A slow forward high aerial establishing shot of the Austin, Texas skyline on a late Fall overcast day. A low profile aerial view of the Austin, Texas skyline with the Colorado River in the foreground. Late Autumn overcast day. A slow forward rising aerial establishing shot (DX) of the Austin city skyline with the Pfluger Pedestrian Bridge over the Colorado River in the foreground on a late sunny Autumn day. A wide rising aerial establishing shot of a cargo train traveling over a railroad bridge over the Colorado River with the Austin, Texas skyline in the distance. A slow rising aerial establishing shot (DX) of the Austin city skyline with the Pfluger Pedestrian Bridge and Lamar Boulevard Bridge in the foreground on a late sunny Autumn day. A slow reverse aerial establishing shot of the Austin, Texas city skyline on a sunny late Autumn day. Railroad bridge and Colorado River in the foreground. A slow rising aerial establishing shot (DX) of the Austin city skyline with the Pfluger Pedestrian Bridge and kayakers in the Colorado River in the foreground on a late sunny Autumn day. 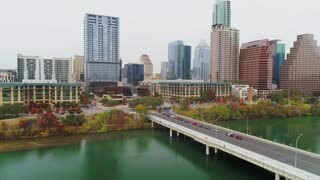 AUSTIN, TX - Circa December, 2017 - A slow rising reverse aerial establishing shot of Austin, Texas and the Colorado River on an overcast evening.